Available Daily EXCEPT Sunday at 7:30 am, 10:00 am, 12:30 pm. Our Hawaiian ancestors introduced surfing to the world. For an authentic Hawaiian experience come learn from the most elite surfers in all of Hawai'i. 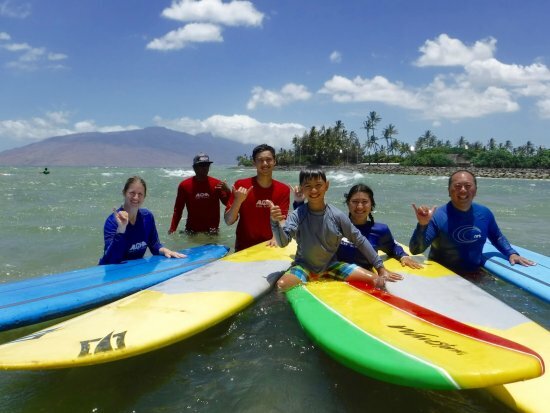 They specialize in teaching surf lessons to ages 5 and up, and cater to all abilities from beginner to advanced. It is with hanohano (honor), ha’aha’a (pride) and Maluna o’u kela ko’i ko’i (that responsibility/obligation is on me) that they share the ancient Hawaiian sport of He’e Nalu — to ride a surfboard, surfing, wave riding; literally wave sliding. In honoring the knowledge passed down by generations from our ancestors, we are inspired to share the wisdom, values, and traditions that sustained the Hawaiian culture in the past and will continue into the future!